3 months came and flew by in the Belgian capital. 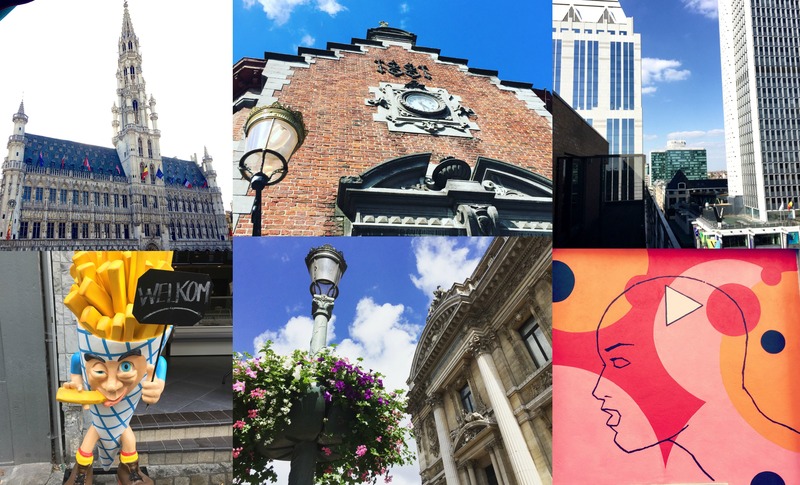 Call it a mini staycation for my husband who’s originally from Antwerp, or an assimilation assignment for me―Brussels was our home base for three months while we switched gears to Belgian life. It was the backdrop to an exciting, transitional period of our newlywed lives, and I really enjoyed it. He was taking on a new job, I was looking for one, and above all, we were searching for a house in Ghent to call home. Despite the competitive market and limited time, we found a perfect place that I knew would be it from the moment we stepped inside. It’s a charming home in a historic neighborhood and now we get to have a taste of real Belgian suburbia. It’s been an adventure buying all new furniture and decor…Visiting Ikea 5 times in one month is always fun. Looking back, three months in the heart of a busy, thriving capital flew by and really excited me to be living back in Europe with Laurens. I’m glad we lived there even if just for a bit, because Brussels really surprised me. People who love Brussels will tell you you have to get to know it and that couldn’t be more true. It’s a city that has it all―good and bad―but mostly good. I peer out the window and glance down from our 8th floor apartment to see how people dressed today. After gleefully ignoring warnings about unpredictable weather in Belgium, I now know the weather can ignore even the hottest and stubborn of seasons. Once I’m out, I’m gone for hours, so layers and good shoes are essential. (I don’t say umbrellas are, because I detest dragging them around and always have.) Descending into the city with black jeans on, white sneakers, a dainty pink top and light sweater, I realize my style has morphed―and I realize how little effort I put into my everyday wardrobe in Malaysia. Our apartment is basic and typical of a pre-furnished place, and I don’t spend much time there if I can help it. With a hospital just down the road, sirens and ambulances howl constantly day and night, but I’ve gotten used to even the funniest of sounds: ambulances here sound like hysterical grandmothers crying. Once I’m out, I’m just ten minutes walking from beautiful tourist havens like the The Grand Place and Place de la Bourse. Thrown back into European life takes daily pinching. I’m happy in my element in any city, but Brussels has been the backdrop to a time where I was reinvigorated in every way. Really, we moved back to Belgium with the hope that I could start where I had left off in terms of my career, and I felt so excited and relieved to get the green light to work here. Overall, I’ve learned to love this city some call “boring” or “unsafe”. Boring seems like a stretch, since there’s endless events and happenings filling the city, with an unsurpassed international flavor to pull inspiration from. And besides two terror attack false alarms in the past months, (both just minutes from our apartment), I feel as safe as can be expected considering the number of upsetting and unprecedented numbers of attacks in Europe this summer. I’ve gotten used to all the military presence, but never feel 100% at ease. Despite this, I didn’t stop doing things like taking the metro or going to festivals. At the back of my mind though, I’m always aware that times are different now. As I turn the corner of our building, a strong sun beams over me, which is odd because the other side of the building was just overcast and dark. Right as I start to regret dressing too warm, a cold air blows through and instantly cools me down. That fall feeling is what I missed about Europe and the US. Sure, it’s mid July and people are wearing jackets and boots on summer days, but Brussels reminded me strong sun and cool weather can blissfully coexist. I march down the wide boulevard observing the even wider range of people attracted to the city’s periphery. Our apartment is in an interesting area: It’s not a bad area, but let’s say there are some questionable people passing through. Prostitutes propped up by bright stilettos line the quiet back streets, awaiting the next business opportunity; The occasional drunk homeless man stumbles around, mostly causing no trouble. The occasional arrest goes down. But I listen to my music and walk on. Beyonce’s Lemonade is in my ears, and I feel good. By now I ignore the oddities and strut on. I’ve always called myself a city girl, and in fact, I adore most everything about city life. My extrovertedness requires me to soak up energy from outside sources and a city is a perfect playground to do that. Something about exploring solo, the commotion, people, sights and smells recharges me. I’ve always had a great sense of direction, and each new city I move to is mapped out within a matter of days. Treating the streets as a maze, I trace my way back home everyday. In Malaysia, walking to get to where you wanted to go just wasn’t possible and I had become lazy and more isolated than I’d like to admit. These days, I make it a point to walk wherever my feet can take me. Once I secure my spot at the communal table at my favorite café (OR Espresso), I hear people chatting in Dutch, French, Spanish and everything in-between. People switch effortlessly between languages as I eavesdrop in awe. Right as I’m thinking to myself how international this city is, a bubbly blonde interjects and compliments my shirt followed by a wide smile. Her familiar accent gives her away, and without skipping a beat, she asks where I bought it. Like old friends, we exchange for 30 seconds about my shirt―nothing else―both of us realizing we’re most definitely American. I had forgotten how easy it is to strike up conversation with American strangers, no matter where I find myself in the world. A twinge of homesickness rushed over me as I craved to chat about everything and nothing with such enthusiasm. It’s easy to have these small interactions without it being weird, mostly because most Americans appreciate small talk. After our chat, I feel oddly out of place; these are the moments I feel most aware of my foreignness and realize I haven’t been around Americans in so long. Living in Paris was the closest thing I could say I’ve been to living in a big European city like Brussels. The air is undeniably different here, and so are the people. The city is more compact and the charm is particularly Belgian: laid back, open, eclectic. Vibrant outdoor nightlife, delicious markets, neighborhoods…We’ve visited our share of summer terraces, rooftop bars, markets and restaurants and it’s been glorious. Belgium is a great country and it’s been exciting to get to know the people, the personality and overall way of life here. Geographically at the crossroads of Europe, it’s no surprise that Belgians are open-minded, friendly, multi-cultured and intelligent people. I’d be lying if I were to say the move has been completely without dips, but it’s been pretty close. There have been a few low moments about finding work, friends and learning the language, but those moments passed quickly. I know they might come again, but I’m okay with that. Job interviews are rolling in, we found a place and things are looking great. These three months have been saturated with feelings and memories so heart warming, I have to remind myself to soak up the goodness. Transitioning from Asia to Europe was a major change, but after being here for four months I can honestly say the fun is just beginning and that we’ve done pretty damn good.